The Hesse HBR50 Rifle is a single shot, bolt action rifle. The bolt is of the shell holder type for positive extraction. The receiver and bolt are machined from solid SAE 4140 Tool Steel. This rifle features a barrel with a match chamber and a BOLD trigger that is fully adjustable for pull weight and over travel. The HBR50 will accept SOME surplus ammunition but, due to the dimensional differences inherent in surplus ammunition, not all will fit. The HBR50 is capable of sub-minute accuracy out beyond 1000 meters with match grade ammunition. Tube Diameter: 30mm Objective (front) Diameter: 67mm Ocular (rear) Diameter: mm Adjustable Objective: Yes Adjustment Click Value: 1/8 minute of angle Eye Relief: 3.5" Field of View at 100 Yards: 29 Feet at 4 Power 8 Feet at 16 Power Lens Coating: Multi-coated Length: 16.4" Weight: 29.4 ounces Notes: Water, fog, and shockproof Warranty: Millett Lifetime Guarantee - Transferable lifetime warranty against manufacturing or material defects. This is scope #2 in my quest to see what works and what don't scope #1 was an ATN 8x24x75LU. Although an interesting scope in its own right. Continual internal contamination of the optical plane the reticule is etched onto resulted in several trips (at my expense) back to ATN for flushing. The kick, or more so the "sudden stop" or "reverse kick" if you will caused by the huge caliber kicking the rifle back and the sudden massive stop resultant from the efficient muzzle brake caused contaminants (mechanism lubricant or phosphate type coating) from the inside of the scope to move around and lay upon the reticule optics. This would not even be a problem on a gun that has no kick or muzzle brake. The ATN has been sold with full disclosure about its history to an owner with a lighter rifle. I call this millet part #2 because although I do have faith that it could work, This purchase was shaped most or in part, by a FCSA magazine article where Millet Buck Gold like this one, was put onto a 50 BMG torture test rig. It survived where many other scope makers didn’t, or where other scope makers were too afraid to even submit a sample for testing. I now have about 250 rounds through this scope without failure. I know a Leupold, Nightforce, or IOR/Valada would work for sure, I have no doubt this is what any sane person would be using. 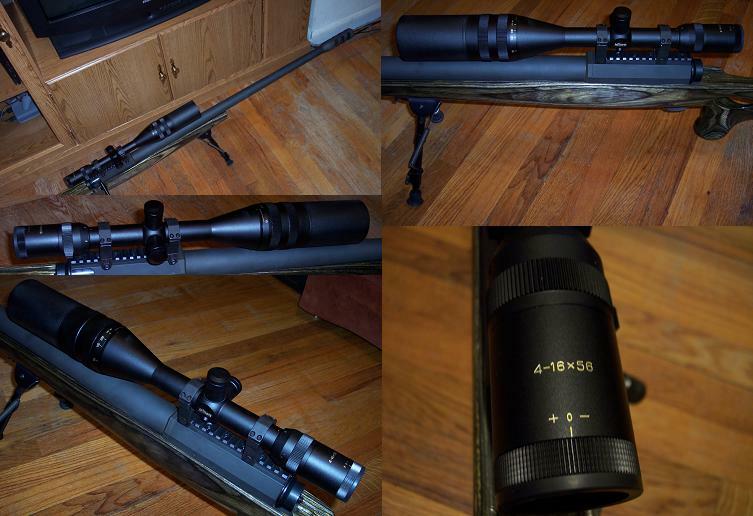 But this is much more fun and helps me equip my other rifles with a nice yet eclectic collection of optics. This is a comparison of the old Hesse bolt type and both the older and newer Vulcan Arms type, and also my nicer mid year “hybrid” bolt. I have the "large two lug" similar to the original old Hesse bolt shown in the top of each picture, but mine has the improved rear portion of the bolt hammer interlock “hat”. Meaning mine is scalloped and machined like the newer Vulcan bolts at the rear. 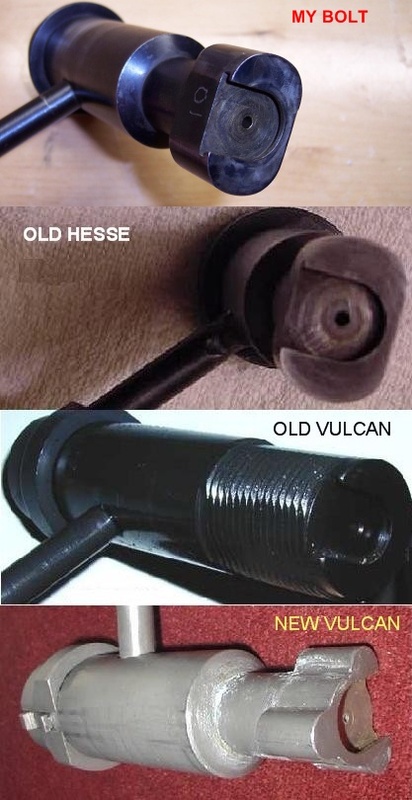 In these pictures, it shows the actual difference between the old Hesse which is safe like mine, and is used by many 50 BMG arms makers and fine, the old less desirable “semi-threaded” Vulcan, and the new Vulcan which uses 3 smaller lugs. I have no experience with this newer 3 lug “clover” Vulcan bolt. The “old” Hesse bolt pictures (top of each) are from another Hesse owner. As you can see, his handle attachment, bolt finish, and rear “hat” machining, are considerably different than mine. I have never found on the internet or otherwise any failure of bolts resulting in injury or damage to the rifle or shooter. I did once hear of a shooter that forced a war era WWII round that was out of spec into the chamber, fired it, and the heavy extra powder charge locked the bolt. He then ham fisted the bolt open with a hammer and broke the handle off. It was returned for repair. The truth of the matter is, any bolt action 50 BMG rifle subjected to an over charged or heavy loaded round will “lock the bolt” making bolt turning and removal firm. This is referenced by many Fifty Caliber Shooters Association members who hand load with very expensive competition bolt guns. If you have to force the round to get it in the rifle in the first place, then maybe you should rethink your source of ammunition. Let us do a little FAQ about 50 BMG rifles. There seems to be more misinformation than decent truthful information. This is not abnormal considering that gun control as an ideal in general is based on emotion not fact. I want to address the most inflammatory of the group first. Considering that a common pigeon could bring down a jetliner I say “Why would they bother trying?” The question is loaded, seeing as any kind of firearm could theoretically bring down a jetliner. A shot from a .22 in the right spot could “theoretically” make it happen. This would require a perfect shot into a mechanical apparatus that wasn’t redundant. The chances of bringing down a jetliner at any altitude with weapons larger than a 50 BMG even during takeoff and landing would take a shot which would involve more luck than skill. Simply making a half inch hole in a critical spot on such a huge aircraft while it is flying would be a shot envied by heroic anti-aircraft battery operators of World War Two. The chances of hitting a flying object with a rifle of any kind are slight. If this were not true bird hunting with shotguns would never have been created. Please consider this; a wooden Japanese A6M “Zero” from WWII loaded was loaded with much more explosive gasoline and munitions such as bombs and torpedoes. It was powered by only one engine and was without the benefit of self sealing tanks or redundant systems. Even a zero could simply fly home after being pounded by the six 50 BMG wing mounted machine guns from a pursuing Navy F6F Hellcat in the Pacific theater. Six 50 BMG Machine guns! That would be literally hundreds of 50 BMG holes in seconds, and simply fly home. There is a television show I enjoy with a couple characters from San Francisco called “Myth Busters”. Their test methods are not always strictly scientific but they are thorough and often exceed the static testing procedures found in laboratories with a more reasonable and much more dynamic hands on test which often and easily exceeds the parameters that could be established in a lab. They had an episode where they pressurized the cabin of an aircraft and commenced to perforating it with 9mm (around .36 inch) projectiles. It seems that there was no explosive effect even with the cabin pressurized beyond that of normal convention. 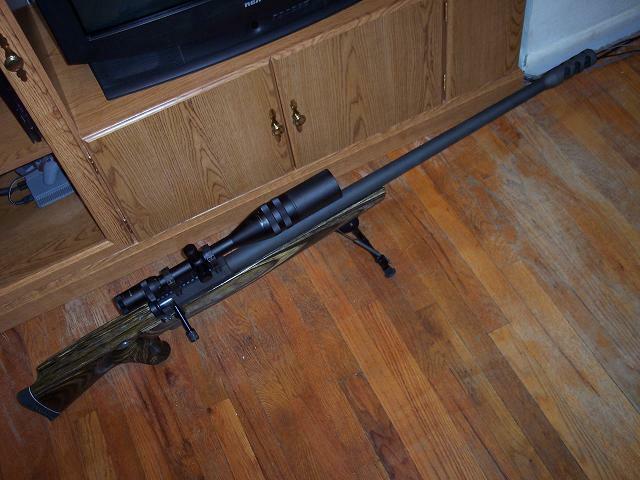 A 50 BMG is about just over .14 inch larger in diameter, or roughly the diameter of a bb-gun pellet larger. It seems that a jetliner cabin is actually already full of holes and it has a few compressors which do the job quite well of keeping up with the leakage that occurs in a cabin. This is why armed sky marshals are once again flying on planes without fear of a bullet hitting damaging even a window in a jetliner. The windows in a jetliner are of lexan and safety glass. They have two panes. Even if one or both are perforated neither will explode or “shoot out”. Why would a terrorist bother? With rockets and mortars and missiles at their disposal, why would they bother with some competition rifle? Joe terrorist is going to go to a gun store counter, hand over $3000 of hard earned terrorist support money, and identify himself to authorities to have his background check run to buy a weapon that isn’t even ideal for the work he intends. A 50 BMG rifle has one purpose, and only one purpose, sporting use. It can’t be used to kill a person “dead-er”. It is too expensive to obtain and equip for criminals to consider. Knowing a few owners of 50 BMG’s I have yet to see one that could afford a $3000 rifle but not the $500 safe to keep it in. Terrorists are lazy, they are opportunists, and like water or electricity they take the path of least resistance. Why bother with trying to crack some guys safe or risk capture by authorities by buying one. You think a terrorist would go to a gun store where he can only buy a semi-automatic AK47 instead of just bringing his own fully automatic version? The borders are wide open, they can just cross at night, toss stuff over a fence, or simply have some drug runners deliver all of the bombs, guns, and rockets purchased from the third world countries to the south. Considering that the popular figure tossed around by gun banners is 4500 meters, after all of the years that 50 BMG’s have been around (much longer than the 1987 figure used by most gun banners) it wasn’t until recently that a shot of nearly half that distance was finally perpetrated against a stationary target by Canadian snipers in Afghanistan. It seems that a professional Canadian sniper taking his time to make a few shots until he finally hit his target fired a distance of around 2500 meters. This is a government trained individual, with better equipment that most people have, in an ideal situation, making multiple shots to hit a stationary target. The best 50 BMG shooters in the world are actually national competitors. They shoot at 6 foot by 6 foot targets at a distance of exactly 1000 yards. For a typical “average Joe” like me trained in shooting in regular military training I can tell you that shooting at something 1000 yards away usually yields a shot that completely misses the target, and I qualified an expert marksman rating. A 50 caliber projectile, in tracer, incendiary, or even the hard to get military exploding ammunition shown on this page actually does a very poor job of igniting stored flammable liquids or gases. It is not like on TV where one shot from the hero's gun ignites the gas tank of the escaping bad guy’s car incinerating them in a huge fireball. Remember the thing I mentioned with the Japanese Zero earlier? Contained flammables just won't ignite very easily when exposed to the kind of momentary ignition source provided by a hot, incendiary, or tracer bullet. A much more sure fire way to get something like that to light off is some explosive, the kind planted by terrorists as bomb, or from a rocket (which I mentioned earlier) of the kind insurgents use everyday against our troops overseas. Once again, why bother with something that won't or is likely not to work when you have tools that will? So in conclusion I would like to say that 50 BMG rifles have never actually been used in the commission of a crime, because the capabilities, costs, and size and weight of the rifle make it impractical if not impossible to do so. Using the "Oh no, terrorists! 9/11, etc." excuse to limit the freedoms of Americans is a job the government is doing well enough on their own, without some self serving and misleading gun grabbing groups or liberal agendas media jumping on the band wagon. I would like to also note to liberal press 2nd amendment attackers out there that in a recent survey of 112,003 high school students, 1 in 3 think the press and 1st amendment ought to be more restricted. Need hosting? I shopped around and I have more storage and bandwidth than I ever dream of using for less than $50 a year! Click below.